“Nothing is set in stone with interior finishes in our log homes,” said Joe Dymond of Jim Barna Log Homes. When Joe makes this statement he means it. Although most people associate log homes with a rustic interior design – many owners today have a broader decorating vision for their new home. 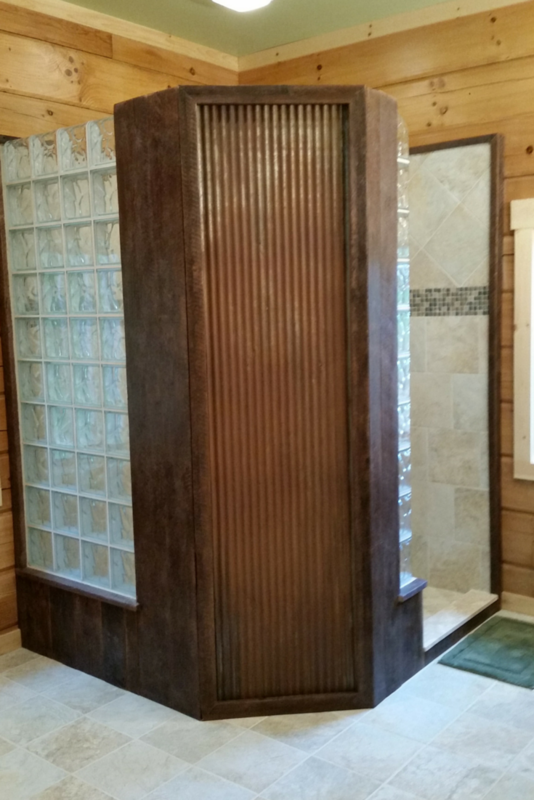 Such was the case when Joe called me about combining contemporary glass blocks with traditional rustic elements in the master bathroom of a home he was building in Quakertown, Pennsylvania for Ken and Laurie Rittle. In the article below see how contemporary can meet rustic when you combine a flexible builder with progressive and creative homeowners. One of the biggest challenges I have seen with custom building is integrating new ideas and products with practical and sound building techniques. As Joe said to me, “It’s OK to design as we go….but we’re going to build this project right the first time.” It was this open and flexible design philosophy which allowed this log home to literally evolve during the building process. 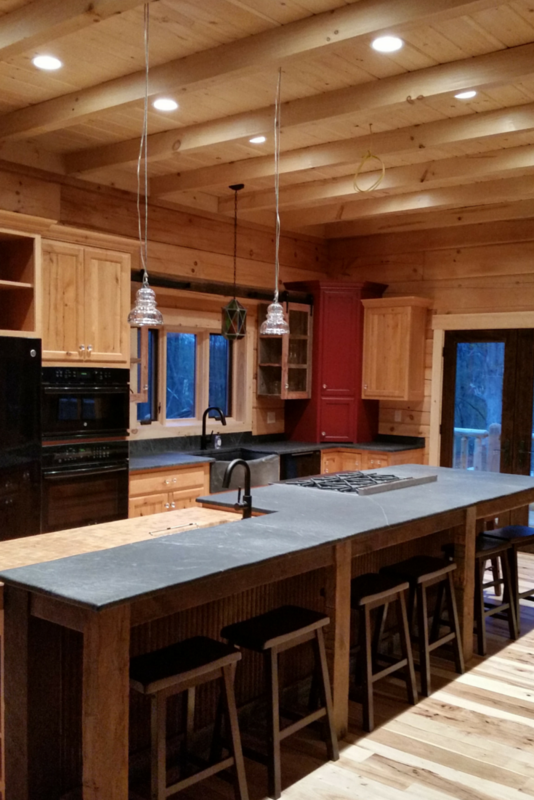 For example, in the kitchen Joe’s customers (Ken and Laurie) decided to combine 100 year old rustic barnwood with the sleek look of contemporary soapstone countertops. When it was apparent there was going to be extra barnwood left from the kitchen ideas began to bubble up on how to use this distinctive reclaimed wood in the master bathroom to provide a consistent style and continuity through the home. 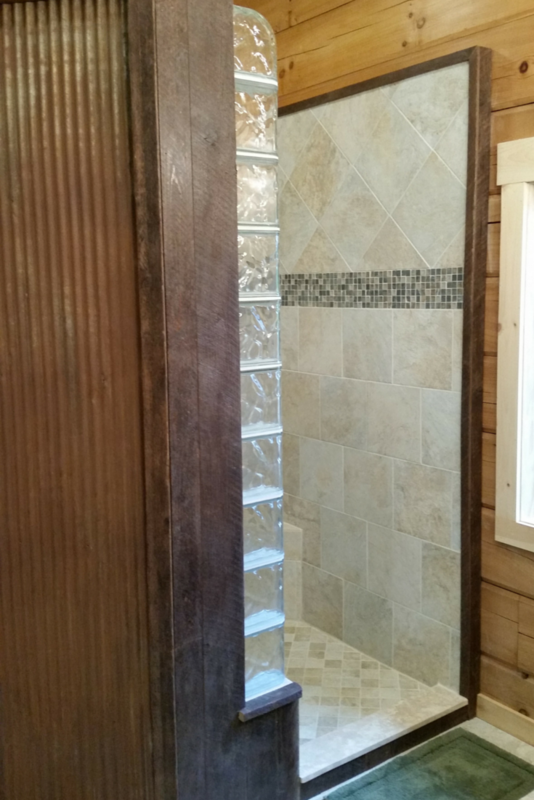 Let’s take a closer look below how creativity and a unique grouping of product choices (including the barnwood trim) resulted in a distinctive master bathroom. Open shower design – I am increasingly seeing new homeowners refusing to deal with difficult to clean shower doors by eliminating them altogether. This NEO angle shower was designed with the shower head spraying away from the doorless entry making it easier to enter and clean the shower. Glass block shower walls – Glass blocks are durable, easy to clean and can create a clean, fresh design. The rounded and finished glass block ends create a graceful entrance. Joe appreciated that the glass block walls were prefabricated into sections which drastically cut down installation time and improved finished quality. This wall was sourced from Innovate Building Solutions from Columbus Ohio. Granite countertops – Ease of maintenance and a luxury custom look have positioned granite as a preferred countertop choice in many high end master bathrooms including this project. Ken and Laurie chose a typhoon green granite with a chiseled edge and 4″ backsplash they purchased from Prestige Marble and Granite in Emmaus Pennsylvania. 60 year galvanized corrugated metal feature wall- Who would think reclaimed galvanized corrugated metal could be a focal point for a master bathroom? This wall is not only functional (it houses the plumbing on the other side of the NEO angle design) but it is also fun and distinctive. This featured was purchased from Elmwood Reclaimed Timber in Peculiar Missouri. 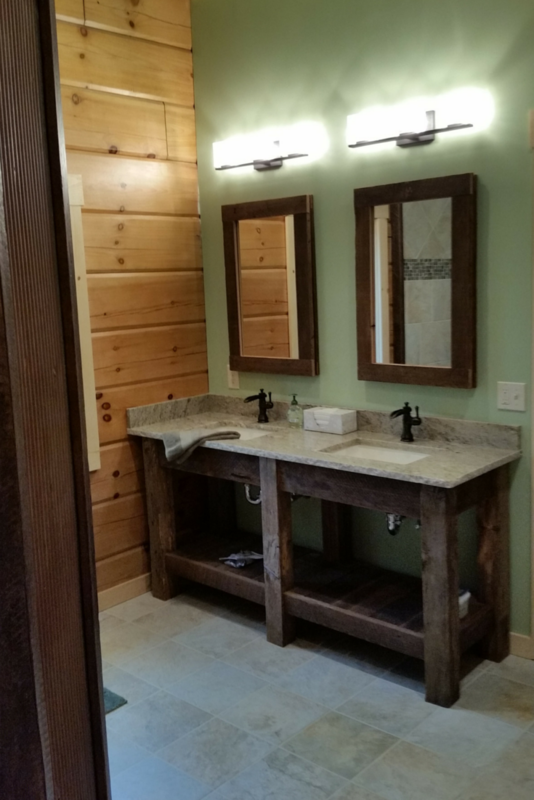 100 year old barnwood trim and custom vanity – The barnwood trim left over from the kitchen was put to good use in the master bathroom. Joe’s team used it to trim out corrugated metal feature wall (see the image above) and as a custom base for a double bowl vanity – very cool and unique. Ken and Laurie found this material through Barnwood Connections in Barto Pennsyvania. Log construction – The 8” x 12” logs truly capture the essence of this rustic luxury home. Which contemporary or rustic feature do you like the best? If you want more information about log homes or contemporary design features like glass block showers comment or call the numbers below. 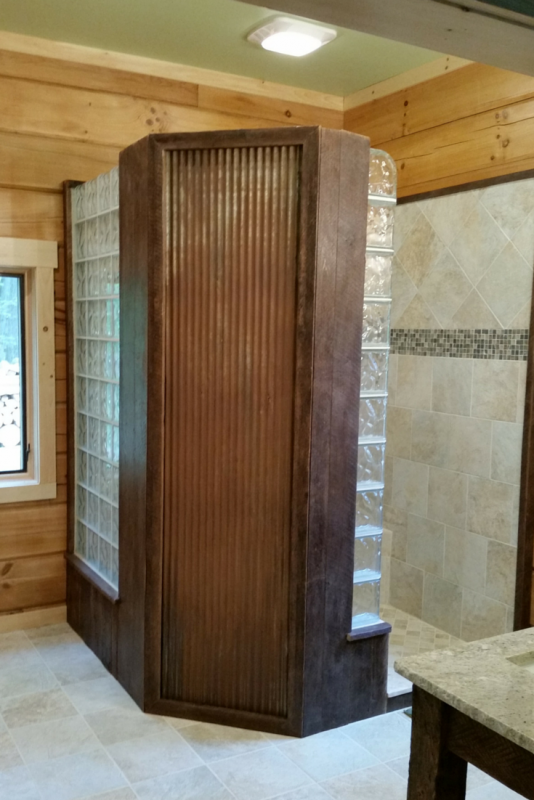 For information on a custom log home contact Joe Dymond at 570-333-4760 or for an estimate or design for a glass block shower call Innovate Building Solutions at 877-668-5888.